Support Political Prisoner Robert Seth Hayes! PLEASE POST AND SPREAD WIDELY AND TAKE ACTION! PLEASE CALL, WRITE AND FAX! Seth suffered another Diabetic Coma or Code Blue today, Feb. 5, 2017! This time he fell so hard he broke a tooth and opened a cut above his eye. He is currently with stabilized sugars in the infirmary with a headache and being monitored and getting X-rays. Seth has been suffering from uncontrolled diabetes for over 16 years now. His sugars go up to the 400’s, then down so low he falls into a diabetic coma. Each diabetic coma he goes into could end in death if not noticed and treated right away or from a fall such as the one that occurred today. We are asking that Seth be given an insulin pump/sugar monitor immediately to avert these near fatal incidents. He had consultation with an endocrinologist at Coxsackie in early October 2016 and was told the paperwork to receive a insulin pump would be pushed immediately. 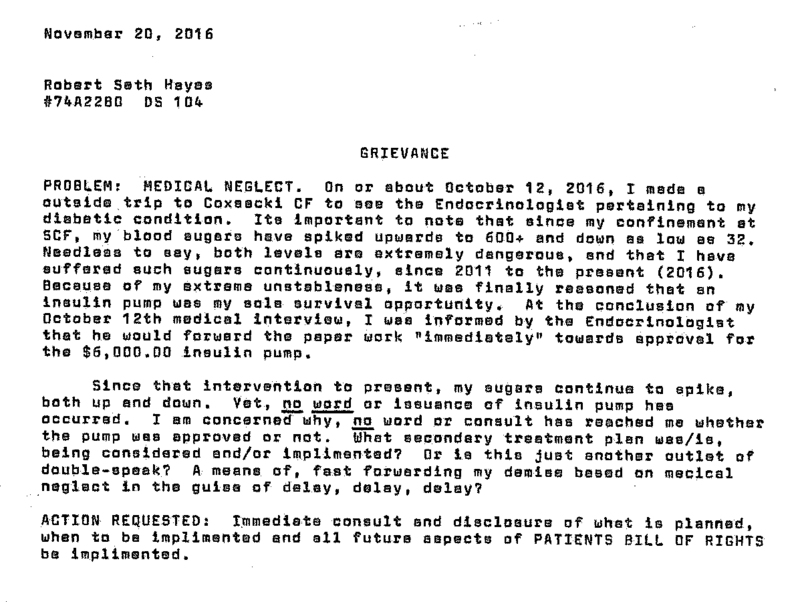 On November 20, 2016 Seth wrote a grievance stating he has not heard anything. He has still not received any response to this grievance almost 3 months later. Despite the endocrinologist’s recommendation, call in campaigns, and the grievance, it is months later and still no pump. The NYS DOCCS is completely aware of the situation and is stalling; we cannot afford to have another incident of low sugar. THIS IS A MATTER OF LIFE AND DEATH! Seth’s constant extreme fluctuations in sugar levels have led to him no longer being able to tell when his sugars are high or low. The sugar monitor sends a loud warning if his sugars are beginning to get either too high or too low and the pump allows him to use small dosages of insulin when needed along with his eating schedule and daily activity. In addition, Seth had another incident of low sugar on Monday, November 28, 2016, and was in the infirmary for overnight observation. It really is a matter of life and death that Seth be provided with an insulin pump/sugar monitor as soon as possible. If Seth’s sugars are high in the morning, he is given a dose of Levamir. If his sugars are still high at 11 a.m., he gets a dose of actual insulin. By the time his sugars are checked at 4 p.m. they are usually in the 30’s, prompting an emergency response. We therefore urge you to call, write and fax to demand immediate provision of an Insulin Pump/Sugar Monitor to Robert Seth Hayes 74A2280. Seth needs this device immediately! 1. Immediate provision of an Insulin Pump/Sugar Monitor to Robert Seth Hayes 74A2280. Seth needs this device immediately! 2. A Diabetic Diet that consists of fresh fruits and vegetables and all the current recommendations for diabetics. Not the false diabetic diet that is currently being issued. A bologna sandwich on white bread at night is NOT A DIABETIC DIET! Thank You for Your Time & Effort. It has and continues to make a difference! Jose H. Villarreal Still Being Held After His December 19th, 2016 Release Date! Jose H. Villarreal was scheduled to be released from Pelican Bay State Prison in California on December 19th, 2016 after serving a sixteen year sentence. We received word from Jose in mid-December that his release date had been pushed back to January 2nd, 2017, for unknown reasons. We just received a letter from Jose dated January 3rd, stating that his release date had been pushed back again to TODAY, January 6th. We are anxiously awaiting to hear from Jose to see if he was indeed released today or if they continue to push back his release for no reason. We want to do one last call out for folks to contribute to the post-release support fundraiser for Jose! Sixteen years is a long time to be locked up, and as much as serving time in prison is its own struggle, the post-release period is sure to bring its own struggles as well. One thing we can do to stand with this comrade is to raise some money to help him start his new life with us on the outside. Once he gets settled he has some big plans for what lies ahead! Some of Jose’s goals for the future include working with Chican@ youth, creating a community art space and help Chican@ and prisoner writers and artists get their work out into the world! Jose is a 41 year old Chicano prisoner, currently being held at the infamous California State Prison – Pelican Bay, a prison that sits in the far northwest corner of California in the town of Crescent City.Pelican Bay State Prison sits just north of one of the most beautiful redwood forests, but you’d never know this if you were in a 6’ x 9’ windowless cell, subject to 23 and a half hours of lockdown a day in the Security Housing Unit (SHU). Jose spent the majority of his sentence in the SHU, only having been moved back into General Population almost one year ago. During his time in the SHU Jose tapped into something within him and found a revolutionary spirit that kept him working hard with other prisoners held captive in the SHU to expose just what horrific conditions they were faced with every day. Over the years, Jose has developed as a great writer, artist and organizer and he is dedicated to using his skills to create change. He and other Pelican Bay prisoners took part in three different hunger strikes to protest and put an end to long term solitary confinement. These hunger strikes at Pelican Bay inspired other California prisoners to join the hunger strike movement, a movement that contributed to substantial changes being made in solitary confinement practices in California. Jose wrote about these hunger strikes and the prisoner movement in a great piece titled “The Lumpen Has Stood Up!” which you can check out here: http://poormagazine.org/node/5119. Jose’s writings have appeared in California Prison Focus, The Rock, SF Bayview, Poor Magazine, and 4strugglemag. Some of these radical publications have also featured Jose’s art. He was so honored to have one of his pieces of art in the 2015 Certain Days calendar (http://certaindays.org/), a wonderful project that comes out each year as a benefit for Political Prisoners. Jose Villarreal has become a familiar name within the modern day prison movement through his writing, art and will to stand up for fellow prisoners at Pelican Bay and nationwide. There are those of us outside of prison that have gotten to know Jose as such a person of conviction and integrity, whose work ethic is inspiring. We have transcribed his articles, poems, book reviews and essays to get his words out there. We have celebrated his art that always has such a revolutionary pulse. We have also found each other. We have come together and now we are asking for you to join us in an effort to raise some post-release funds for Jose. Remember that every single donation counts. Donate what you can and please pass this along. Thank you so much for your support! Ps – Be sure to check out the first Update on the crowd funding site, and take a look at all the gifts that are being offered if you donate to this fundraising effort! Post-Release fund for recently released political prisoner, Maliki Shakur Latine! Maliki Shakur Latine just walked out of prison on parole on December 6, 2016, after 37 years behind the walls!! He is finally reunited with his family, friends, and community! His transition into minimum security America is just beginning and support does not end with release from prison! Please donate to his release fund to help him cover the costs of basic survival needs and small comforts as he gets his footing. Thank you for your support and for everything you do for freedom and justice! Maliki Shakur Latine was born in the Bronx on August 23, 1949. In his early years, Latine became involved with the Nation of Islam. It was during this time that he began on the path of confronting society’s oppressive forces. In 1969, Maliki and his brother, Shaqwan, joined up with the Black Panther Party for Self-defense (BPP). Maliki described this period as a very trying time, but also a rewarding one. The discipline was not as rigid as in the Nation of Islam, but it contained the basic elements of discipline essential to any effective organization. With this experience came additional requirements in organizational discipline. Maliki began taking political education classes offered by the Black Panther Party. He studied Chairman Mao, Franz Fanon, Lenin, Fidel Castro, Che, and many others. He was also involved in transforming the theoretical ideals of the BPP into daily practice. Due to the Panthers’ public outreach, which included the Free Breakfast and Lunch programs, free clothing drives and free day care programs, the U.S. government took notice of the Black Panther Party. That such actions were anchored by a revolutionary message caused the US government to view the black radicals as a serious threat. Like many of the Panthers targeted by the US government, Maliki found himself behind prison bars, specifically in Riker’s Island. There he met one of the Panther leaders, Lumumba Shakur. Lumumba and 20 other Panthers (known as the Panther 21) were facing trumped up charges, which included a plot to blow up various locations in New York City. All of the Panther 21 would eventually be freed from the charges. Maliki Latine was soon released from Rikers and returned to the Panthers, only to find that the government’s tactics against the organization forced many of them to go underground. Following their lead, Maliki and his brother decided to follow suit. Maliki then spent two years training and studying and engaging in various actions. Two years after going underground, Maliki and his brother attended the funeral of Zayd Malik Shakur, who was killed during an altercation with police on the New Jersey turnpike. Maliki continued to participate in the liberation movement for six years before being arrested. At 4:45 on July 3rd, 1979 NYPD officers pulled over a Chevrolet Malibu on 148th Street, near 7th, in Harlem. With guns drawn, the two officers approached the car. A gun battle broke out, leaving one of the officers and one of the occupants of the car injured. The four occupants escaped, but in the car the police found two spent shotgun shells, additional ammunition, a .45 caliber revolver, and a .357 caliber revolver. Down the street they came upon a recently fired twenty-gauge shotgun. The police also claim they found the prints of Jose Saldana and Maliki Latine. Several hours after the shooting, after the police followed a trail of blood, Arkill Shakur was captured outside a building at 285 West 150th Street, with leg and ankle injuries he incurred in the gunfight. He was taken to the hospital and was later charged for his involvement in the altercation. Just over 2 weeks after the shooting, on July 18, police and FBI raided the apartment of Dwight (Jamal) Thomas in Astoria, Queens. They arrested him and charged him with the shooting. A month later, on August 7, 1979, Maliki Latine was arrested in St. Albans, Queens, by a joint force investigating a series of bank expropriations. They charged him with the July 3rd incident. It wouldn’t be until six months later that the police would arrest their final suspect, Jose Saldana. Sixteen days after the capture of Saldana, Latine and three other prisoners, who were also accused of killing cops, attempted to escape from the special security area of Rikers Island. The men managed to get outside of the prison walls, but three of them, including Latine, were immediately captured. The fourth escapee’s body was discovered days later, dead because of apparent drowning. Maliki Latine and Jose (Hamza) Saldana were indicted on charges of attempted first-degree murder, four counts of criminal possession of a weapon, and criminal possession of stolen property. On October 1, 1981, the two were sentenced to 25 to life. Jamal Thomas was initially charged as a co-defendant in the case, but chose to have his case severed. He was later sentenced to life in prison for another altercation while in prison and an additional 15-year sentence for a prison standoff. In August 1993, the district court overturned Latine’s conviction and ordered a new trial within 120 days or his release. The state appealed, and the second circuit reversed the district court’s decision to overturn the conviction. Finally, the U.S. Supreme Court refused to hear any further appeal and denied him a writ of certiorari, even through his appeal is founded upon the mandate of the U.S. Supreme Court’s own rulings. Here we are again. This time the year is 2016. It has been more than 41 years since I last walked free and was able to see the sun rise and sit and feel the earth beneath my feet. I know there have been more changes then I can even imagine out there. But I do know that there is a struggle taking place as to whether this country will move on to a more sustainable way of life. This is something we wanted to have happen back in the seventies. I watch the events at Standing Rock with both pride and sorrow. Pride that our people and their allies are standing up and putting their lives on the line for the coming generations, not because they want to but because they have to. They are right to stand up in a peaceful way. It is the greatest gathering of our people in history and has made us more connected than ever before. We need to support each other as we make our way in these times. Water IS life and we cannot leave this issue for our children and grandchildren to deal with when things are far worse for the natural world then they are now. And Mother Earth is already in struggle. And I feel sorrow for the water protectors at Standing Rock because these last few days have brought a much harsher response from the law enforcement agencies there and our people are suffering. At least they are finally getting attention of the national media. My home is in North Dakota. The Standing Rock people are my people. Sitting Bull lies in his grave there at Fort Yates. My home at Turtle Mountain is just a few hours north of Standing Rock, just south of Manitoba, Canada. I have not seen my home since I was a boy, but I still hold out hope of returning there for whatever time I may have left. It is the land of my father and I would like to be able to live there again. And to die there. I have a different feeling this year. The last time I felt this way was 16 years ago, when I last had a real chance for freedom. It is an uneasy feeling. An unsettling one. It is a hard thing to allow hope to creep into my heart and my spirit here in these cold buildings of stone and steel. On one hand, to have hope is a joyful and wonderful feeling, but the downside of it for me can be cruel and bitter. But today I will choose hope. I pray that you will all enjoy good health and good feelings and I thank all of you from the bottom of my heart for all you have done and continue to do for me and for our Mother Earth. Please keep me in your prayers and thoughts as these last days of 2016 slip away. I send you my love and my respect for all of you who have gathered in the name of mother earth and our unborn generations. I stand with you there in spirit. Call President Obama for Leonard Peltier: 202-456-1111 (White House Comment Line) or 202-456-1414 (White House Switchboard); and send a text to these numbers if your cellphone provider allows for text-to-landline service (a fee may apply) . Post a comment on Obama’s Facebook page: https://www.facebook.com/potus/?fref=ts&hc_location=ufi or message him at https://www.facebook.com/whitehouse (or https://m.me/whitehouse). Send a tweet to President Obama: @POTUS or @WhiteHouse and use hastags #FREELEONARDPELTIER #LeonardPeltier and/or #FreePeltier. Write a letter: President Barack Obama, The White House, 1600 Pennsylvania Avenue NW, Washington, DC 20500. Watch the calls to action by our friends at the Human Rights Action Center. Then please urge President Obama to grant clemency. Also visit the 2016 clemency campaign for Leonard Peltier hosted by Amnesty International – USA and take action. The Office of the Pardon Attorney (OPA), DOJ, welcomes communications regarding clemency matters. Express your strong support of Leonard Peltier’s application for clemency in a letter, email and/or phone call to the OPA. Make reference to Leonard Peltier #89637-132 and his application for clemency dated February 17, 2016. Urge the OPA to recommend to President Obama that he grant clemency to Leonard Peltier: Honorable Robert A. Zauzmer, Acting Pardon Attorney, U.S. Department of Justice, 950 Pennsylvania Avenue, Washington, DC 20530; Telephone: 202-616-6070; Email: USPardon.Attorney@usdoj.gov. ***Holidays are approaching! Time to buy the 2017 Certain Days: Freedom for Political Prisoners Calendar. The Certain Days: Freedom for Political Prisoners Calendar is a joint fundraising and educational project between outside organizers in Montreal, Toronto, and New York, in partnership with three political prisoners being held in maximum-security prisons in New York State: David Gilbert, Robert Seth Hayes and Herman Bell. Your group can buy 10 or more for the rate of $8 each and then sell them for $12, keeping the difference for your organization. Many campaigns, infoshops and projects do this as a way of raising funds and spreading awareness about political prisoners. This year’s theme is Sustaining Movements, and features art and writings by Farha Najah, Sekou Odinga, David Gilbert, Daniel McGowan, Oscar Lopez Rivera, Sophia Dawson, Chris Dixon, Emory Douglas, Laura Whitehorn, Mumia Abu-Jamal, Xinachtli, Micah Bazant, Capital Area Against Mass Incarceration, South Asian Women’s Community Centre, Mazatl, Marius Mason, Eric King, Kevin “Rashid” Johnson, Jennifer Meeropol, Leonard Peltier, Amanda Priebe, the Termite Collective, Walidah Imarisha, Ali Cat Leeds and more. The proceeds from Certain Days 2017 will be divided among these groups: Addameer Prisoners Support and Human Rights Association (Palestine), Release Aging People in Prison (RAPP) and the Unist’ot’en camp. Our calendar project was suggested by Herman in 2001, and has been shaped throughout the years by all of our ideas, discussions, and analysis. All of the current members of the outside collective are grounded in day to day organizing work other than the calendar, on issues ranging from migrant justice to community media to prisoner solidarity. We work from an anti-imperialist, anti-racist, anti-capitalist, feminist, queer- and trans-liberationist position. We are asking all organizations, communities, unions, churches, activists, political parties- to CALL ON THEIR INDIVIDUAL MEMBERS to sign this petition and spread the word- this is a time-sensitive request! We must try to achieve the signing of 100,000 signatures by December 11. No matter how many petitions you have signed- SIGN THIS ONLINE PETITION and get everyone else to do the same. Do not let anyone tell you they have signed petitions or letters before- this is the one that will be highlighted. Help former political prisoner Barbara Curzi deal with cancer! Carol Saucier, Ray Luc Levasseur and I write today to ask that you help our dear sister and former co-defendant, Barbara Curzi. Barbara is a former political prisoner, one of the Ohio 7, who, after their arrests in Ohio in 1984, went on trial for actions by the United Freedom Front against corporations who upheld apartheid in South Africa and contributed to the wars in Central America. (Please donate). Unfortunately, Barbara was recently diagnosed with a very aggressive form of breast cancer. She is beginning an intensive six-month chemo regimen and then is expected to undergo surgery, possibly followed by radiation. Barbara lives in Greenfield, Massachusetts with her cats and dog and hopes she can keep her home while she fights this terrible disease. Barbara hasn’t been well for a while most especially since she lost her beloved son, Ricky (whose father is political prisoner, Jaan Laaman) five years ago. The more health problems she had, the more she has struggled financially to keep a roof over her head and is now dangerously close to losing that. She was about to get a part-time job just before her diagnosis,to supplement her disability check but now instead finds herself way behind not only on her mortgage and utilities, but can’t get Internet and phones services back until she pays them off completely. Fortunately, the amount to keep her in her home and get her back to functioning, is not so insurmountable that we can’t raise enough to at least take those worries away from her. Once caught up, Barbara would still need some support to keep up with her monthly expenses, while waging this battle. Her struggle will be compounded by additional expenses related to trying to get better, including travel and integrative treatments, among other things. Suffice to say that she is in dire straits and those of us who love and respect her, want to reach out to others who can chip in whatever they can to help alleviate her burdens. Barbara served 7 years of a 15 year sentence she received after conviction in Brooklyn, New York for Conspiracy. She returned to Massachusetts after her release from the federal prison system to rebuild her life with her children. As many former prisoners, and especially political prisoners, Barbara has struggled to find work and survive, but she is still deeply committed to the struggle for justice. Donations received will go directly to Barbara to help alleviate her troubles. Please spread the word by sharing this email and contribute whatever you can. Thank you. Political prisoner and former death row inmate, Zolo Agona Azania, needs your help. Zolo will finally be released in a few short months, in February 2017, after spending 35 years in prison, 27 years on death row. Zolo is a prolific writer and an accomplished artist. His writings and art reflect his deep commitment to the Black freedom struggle and a just world for all people. Zolo will exit prison practically penniless and will face enormous financial challenges. He will need to pay for housing, food, clothing, transportation, furniture, a cell phone, utilities, and the many other expenses we all encounter. Zolo will seek employment but at the present time he has little savings. He has been paid $.35 an hour during most of the time he has worked inside Indiana’s prisons. Let’s ease Zolo’s path and make sure he does not confront his financial challenges—and all the challenges he will face–alone. Please donate generously. Zolo is alive today due to his efforts and the work of his supporters and a strong legal team. The Indiana Supreme Court twice reversed his death penalty conviction due to racially discriminatory practices that occurred during the trial process. Zolo is a jailhouse lawyer. He has done legal work on his own behalf and for other inmates. He has acquired a paralegal certificate and has gained an associate degree by completing 2 years of college work. In spite of his difficult circumstances, Zolo is a positive person with a quick smile and a vibrant laugh. Let’s answer his positivity with support. All funds will go directly to Zolo and will be deposited into a fund managed by a team that has supported him for 13 years. For more information contact: zoloazania.org and the Chicago Committee to Free Black Political Prisoners.